Makerere University Business School (MUBS) is the school of business of Makerere University, Uganda's oldest university. MUBS provides business and management education at the certificate, diploma, undergraduate and postgraduate levels. The school's campus is located at Plot 21A Port Bell Road, in Nakawa Division, one of the five administrative divisions of Kampala, the capital and largest city of Uganda, approximately 5.5 kilometres (3 mi), by road, east of the city centre. The coordinates of the school campus are: 0°19'42.0"N 32°36'59.0"E (Latitude:0.328333; Longitude:32.616389). MUBS was established in the 1960s as National College of Business Studies (NCBS), the national college of business studies. It offered business and management diplomas as well as professional training in business. At that time, the college offered diplomas, the main ones being the Uganda Diploma in Business Studies and the Higher Diploma in Marketing. In 1997, Faculty of Commerce at Makerere University was merged with NCBS, thereby creating MUBS, a constituent college of Makerere University. The staff and students of both institutions were brought together at the 45 acres (18 ha) campus at Nakawa, approximately 5.5 kilometres (3.4 mi), east of Kampala's central business district. In 2001, due to changes in the laws of Uganda, MUBS transformed from a constituent college of Makerere University to a "public tertiary institution" affiliated to Makerere University. However this arrangement did not work well, resulting in Makerere introducing competing duplicate courses at the main campus, while MUBS started to agitate for complete autonomy. Finally in 2012, the autonomy sought by MUBS was granted by the Uganda Ministry of Education and Sports. In January 2012, Ugandan media reported that MUBS will break away from Makerere University and reconstitute itself into an independent university. This will result in the change of its name to a new name, yet to be determined. In August 2013, Uganda's Attorney General began drafting the necessary legislation to separate MUBS from Makerere University. The draft was expected to be presented to the Ugandan Parliament for debate and enactment into law. Bachelor of Procurement & Logistics Management. ^ a b c d e Kagolo, Francis (11 January 2011). "Makerere University Business School (MUBS) is in a transitional process to become a fully-fledged university: School to award own degrees". New Vision. Kampala. Retrieved 19 February 2018. ^ a b Globefeed.com (19 February 2018). "Distance between Post Office Building, Kampala Road, Kampala, Uganda and Makerere University Business School, Port Bell Rd, Kampala, Uganda". Globefeed.com. Retrieved 19 February 2018. ^ Google (19 February 2018). 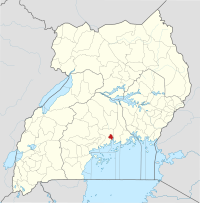 "Location of the Campus of Makerere University Business School" (Map). Google Maps. Google. Retrieved 19 February 2018. ^ Nalugo, Mercy (18 August 2013). "Plans to split Makerere, MUBS are on". Daily Monitor. Kampala. Retrieved 19 February 2018. ^ MUBS (19 February 2018). "The Academic Faculties of Makerere University School of Business". Kampala: Makerere University School of Business (MUBS). Retrieved 19 February 2018. This page was last edited on 19 February 2018, at 05:44 (UTC).